Oak Summit Estates is a limited offering of just five, 4 Bdrm. 4 ½ Bath, Semi-Custom view homes on acre plus lots. In the Orange County foothills east of Lake Forest, these unique homes combine the best of country living with ready access to a wide range of shopping and recreational opportunities. Located a tad west of Cook’s Corner above Santiago Canyon Road, you are just minutes away from Whiting Ranch and the 241 tollway. Alternatively, a lovely country drive to the Northwest on Santiago Canyon Road brings you to East Orange and the 263 tollway with access both to Irvine and the coast or North to the 91 freeway and the Inland Empire. Each home is sited to maximize the views of the surrounding countryside as well as optimize the usability of the outdoor spaces. 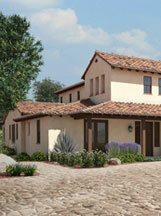 Large native oaks grace the site and authenticate the name: Oak Summit Estates. Although most are set well back, all of the homes are accessed off of their own Wood Canyon Road, a cul-de-sac which offers the promise of a strong sense of neighborhood. With one exception, all the homes have three car garages. A wide, open beamed, porch invites you to enter the home where you are greeted with a two story foyer, bathed in light from high windows. The approx. 4,200 sf homes have been designed for a comfortable and casual lifestyle. A great room with fireplace, dining room and generous nook are laid out to maximize the opportunity for indoor/outdoor living. On the view side of the home adjacent to the nook and kitchen, an open beamed loggia provides a generous covered outdoor living space. The gourmet kitchen is truly the heart of the home and features an oversized island with plenty of room for gathering and casual entertaining. The walk-in pantry and stainless steel Wolf and SubZero appliances attest to the quality of the design and construction. The highlight of the home is a comfortable downstairs master suite oriented to capture the view and separated from the other bedroom suites for maximum privacy. The gracious bath area and very generous dual closets are sure to please. Also located on the ground floor are a guest suite and, adjacent to the foyer, what we are calling a flex room which can serve as den, office, library or music room. Upstairs a generous loft and two more guest suites await; each with its own bath and walk in closet; and, of course, those wonderful countryside views. Our Semi-Custom approach to the construction of the Oak Summit Estates homes means that there are alternate room configurations which can be selected to tailor the home to your life style and family needs. Also, the wide range of choices offered as part of our high quality standards for interior finishes as well as many upgrade options enable you to make your new home an expression of your own personal style. On the financial side of the equation, it is important to note that there is no Home Owners Association and no CFD/Mello-Roos bonds; savings which can substantially increase your borrowing power. Come visit us and share your special vision for that perfect home. Let us help you make it a reality at Oak Summit Estates. Don’t delay; call today to schedule an appointment.